Have or want a Heringo Puppy? 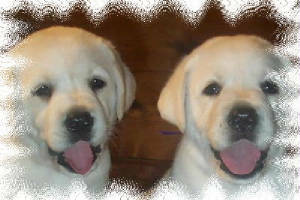 As stated several times on the website, I take my labradors,my puppies and what I do VERY seriously. We place our pet home puppies on limited AKC Reg. to help with two things that we do truly believe in, abolishing puppy mills and over crowding of our shelters. Our pet puppies are placed under a spay and neuter agreement. By by spaying and neutering all companion animals, will we get a handle on pet overpopulation. Consider the fact that in six short years, one female dog and her offspring can give birth to 67,000 puppies!!!!! Isnt that a horrific number? In seven years, one cat and her young can produce 420,000 kittens. With well planned sterilization programs, there would be a dramatic reduction in unwanted animals that end up at the animal shelters. I don't EVER want to be part of the problem! I don't want one of my puppies and her offspring putting out 67,000 puppies just to be abused, put to sleep or whatever the case would be. With Animal Shelters seeing more and more purebred dogs each and every day being turned in by their owners for different reasons: job loss, moving, the economy, etc. I had to put this on the website. Let it be known, that at ANY TIME in your puppies life that you can no longer keep him/her, PLEASE let us know, we would be so happy to take him back. I will NEVER shut the door on one of my puppies. I dont want ANY of my labradors or puppies taken to an animal shelter,surrendered to a rescue organization, advertised in the paper, etc. I will take your puppy/dog back and find him/her a wonderful loving home. If life gets hard for you and your dog must be placed, we understand things happen. We would think MUCH MORE of you for contacting us than for you to place the dog without even letting me know. That is heartbreaking to any breeder that cares.. I will do whatever it takes to get the puppy back home, I will either drive to get him, pay for the shipping, OR even pay for your vet to board him until someone can pick him up. Together, we can work something out.